The airplane flies in an environment that allows it to travel up and down as well as left and right. That up or down can be relative to the flight conditions. If the airplane is right side up relative to the horizon, forward control stick or wheel (elevator control) movement will result in a loss of altitude. If the same airplane is upside down relative to the horizon that same forward control movement will result in a gain of altitude. In any regard, that forward movement of the elevator control will always move the airplane in the same direction relative to the pilot’s perspective. Therefore, the airplane controls always function the same relative to the pilot. Depending on the airplane’s orientation to the Earth, the same control actions may result in different movements of the airplane. [Figure 3-1] The pilot is always considered the referenced center of effect as the flight controls are used. [Figure 3-2] The following is always true, regardless of the airplane’s attitude in relation to the Earth’s horizon. Figure 3-2. The pilot is always considered the referenced center of effect as the flight controls are used. When pulling the elevator pitch control toward the pilot, which is an aft movement of the aileron and elevator controls, control stick, or side stick controller (referred to as adding back pressure), the airplane’s nose will rotate backwards relative to the pilot around the pitch (lateral) axis of the airplane. Think of this movement from the pilot’s feet to the pilot’s head. When pushing the elevator pitch control toward the instrument panel, which is the forward movement of the aileron and elevator controls, control stick, or side stick controller (referred to as increasing forward pressure), the airplane rotates the nose forward relative to the pilot around the pitch axis of the airplane. Think of this movement from the pilot’s head to the pilot’s feet. When right pressure is applied to the aileron control, which is a clockwise rotation of aileron and elevator controls or the right deflection of the control stick or side stick controller, the airplane’s right wing banks (rolls) lower in relation to the pilot. Think of this movement from the pilot’s head to the pilot’s right hip. When left pressure is applied to the aileron control, which is a counterclockwise rotation of aileron and elevator controls or the left deflection of the control stick or side stick controller, the airplane’s left wing banks (rolls) lower in relation to the pilot. Think of this movement from the pilot’s head to the pilot’s left hip. When forward pressure is applied to the right rudder pedal, the airplane’s nose moves (yaws) to the right in relation to the pilot. Think of this movement from the pilot’s left shoulder to the pilot’s right shoulder. When forward pressure is applied to the left rudder pedal, the airplane’s nose moves (yaws) to the left in relation to the pilot. Think of this movement from the pilot’s right shoulder to the pilot’s left shoulder. While in flight, the flight controls have a resistance to a pilot’s movement due to the airflow over the airplane’s control surfaces, and the control surfaces remain in a fixed position as long as all forces acting upon them remain balanced. The amount of force that the passing airflow exerts on a control surface is governed by the airspeed and the degree that the surface is moved out of its streamlined position. This resistance increases as airspeed increases and decreases as airspeed decreases. While the airflow over the control surfaces changes during various flight maneuvers, it is not the amount of control surface movement that is important. What is important, is that the pilot maneuvers the airplane by applying sufficient flight control pressures to obtain the desired result. The pitch and roll flight controls (aileron and elevator controls, stick, or side-stick control) should be held lightly with the fingers and not grabbed or squeezed by the hand. When flight control pressure is applied to change a control surface position, pressure should only be exerted on the aileron and elevator controls with the fingers. This is an important concept and habit to learn which benefits the pilot as they progress to greater challenges such as instrument flying. A common error with beginning pilots is that they grab the aileron and elevator controls with a closed palm with such force that the sensitive feeling is lost. This must be avoided as it prevents the development of “feel,” which is an important aspect of airplane control. The pilot’s feet should rest comfortably against the rudder pedals. Both heels should support the weight of the feet on the cockpit floor with the ball of each foot touching the individual rudder pedals. The legs and feet should be relaxed. When using the rudder pedals, pressure should be applied smoothly and evenly by pressing with the ball of one foot. Since the rudder pedals are interconnected through springs or a direct mechanical linkage and act in opposite directions, when pressure is applied to one rudder pedal, foot pressure on the opposite rudder pedal must be relaxed proportionately. Remember, the ball of each foot must rest comfortably on the rudder pedals so that even slight pressure changes can be felt. 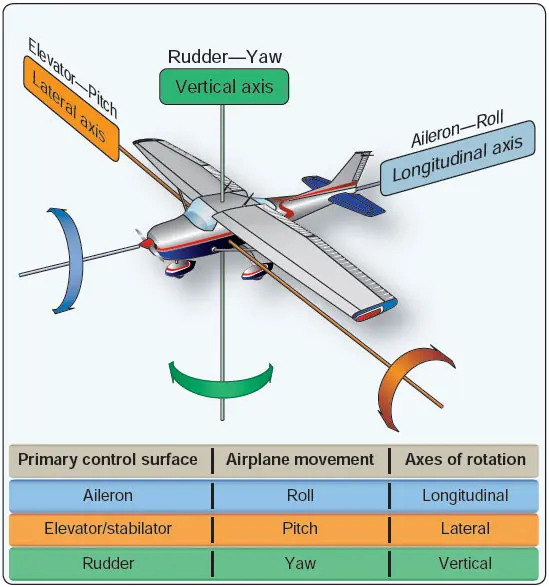 In summary, during flight, it is pressure the pilot exerts on the aileron and elevator controls and rudder pedals that causes the airplane to move about the roll (longitudinal), pitch (lateral), and yaw (vertical) axes. When a control surface is moved out of its streamlined position (even slightly), the air flowing across the surface exerts a force against that surface and it tries to return it to its streamlined position. It is this force that the pilot feels as resistance on the aileron and elevator controls and the rudder pedals. The ability to sense a flight condition, such as straightand- level flight or a dive, without relying on cockpit instrumentation is often called “feeling the airplane.” Examples of this “feel” may be sounds of the airflow across the airframe, vibrations felt through the controls, engine and propeller sounds and vibrations at various flight attitudes, and the sensations felt by the pilot through physical accelerations. Humans sense “feel” through kinesthesis (the ability to sense movement through the body) and proprioception (unconscious perception of movement and spatial orientation). These stimuli are detected by nerves and by the semicircular canals of the inner ear. When properly developed, kinesthesis can provide the pilot with critical information about changes in the airplane’s direction and speed of motion; however, there are limits in kinesthetic sense and when relied upon solely without visual information, as when flying in instrument meteorological conditions (IMC), ultimately leads to disorientation and loss of aircraft control. Rushing air past a cockpit creates a distinctive noise pattern and as the level of sound increases, it likely indicates that the airplane’s airspeed is increasing and that the pitch attitude is decreasing. As the noise decreases, the airplane’s pitch attitude is likely increasing and its airspeed decreasing. The sound of the engine in cruise flight is different from that in a climb and different again when in a dive. In fixed-pitch propeller airplanes, when the airplane’s pitch attitude increases, the engine sound decreases and as pitch attitude decreases, the engine noise increases. In a banked turn, the pilot is forced downward into the seat due to the resultant load factor. The increased G force of a turn feels the same as the pull up from a dive, and the decreased G force from leveling out feels the same as lowering the nose out of a climb. Sources of actual “feel” are very important to the pilot. This actual feel is the result of acceleration, which is simply how fast velocity is changing. Acceleration describes the rate of change in both the magnitude and the direction of velocity. These accelerations impart forces on the airplane and its occupants during flight. 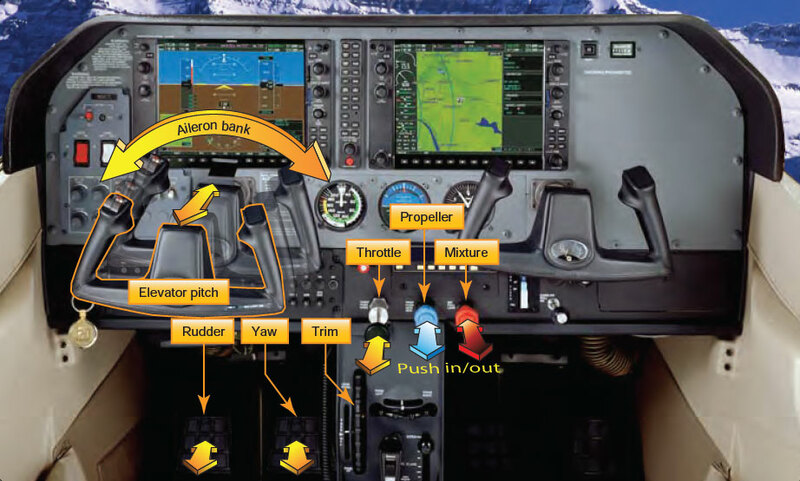 The pilot can sense these forces through pressures into or out of the seat; or shift the pilot from side to side in their seat as the airplane slips or skids. These forces need not be strong, only perceptible by the pilot to be useful. An accomplished pilot who has excellent “feel” for the airplane is able to detect even the smallest accelerations. A flight instructor should direct the beginner pilot to be aware of these senses and teach an awareness of their meaning and their relationship to the various conditions of flight. To do this effectively, the flight instructor must fully understand the difference between perceiving and reacting to sound, vibrations, and forces versus merely noticing them. A pilot who develops a “feel” for the airplane early in flight training is likely to have less difficulty advancing in their flight training.